Significant advances in the diagnosis and management of heart failure and arrhythmias continue to emerge, compelling the practice of cardiology to constantly evolve. These advances must be consistently implemented into clinical practice to guarantee the best care for patients affected by these cardiovascular conditions. 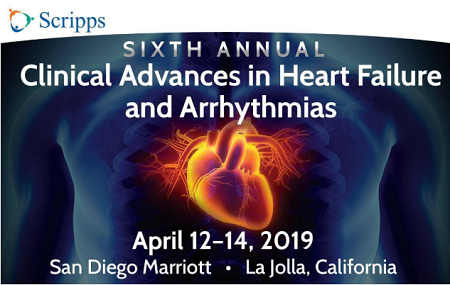 Expert faculty will cover a wide range of topics including the diagnosis, management, and state-of-the-art treatment for heart failure and cardiac arrhythmias. Participants will return to their practice equipped with the latest evidence base and practical information to improve patient outcomes. • Incorporate current and emerging clinical evidence in the assessment, treatment and management of patients with challenging cardiovascular disease. • Apply new concepts in the management of arrhythmias, heart failure and hypertension. • Employ new medical and surgical therapies for heart failure. • Discuss current pharmacologic and medical management strategies for patients with atrial fibrillation. • Assess device based therapies for heart rhythm disorders. • Enhance skills in the management of cardiovascular disease in women. • Illustrate techniques to aid in patient adherence to prescribed medications. • Describe current pharmacologic and medical management strategies for patients with chemo-induced cardiomyopathy. • Identify appropriate treatments for peripheral vascular disease. • Determine the effect of comorbidity and chronic conditions on patients with heart disease. • Outline best practices for the management of patients with atrial fibrillation. • Integrate new guidelines for hypertension and heart failure management into practice.